Banglalink 30GB 298Tk Internet Offer! 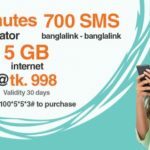 Bangladeshi most popular telecommunication company Banglalink has come to their valuable prepaid customers to activate Banglalink 30GB Internet 298Tk Offer. It is very special and low price internet offer for all subscribers. We all know that Banglalink all times brings to chief internet package and low price call rate offer. Its continuation they have announced to activate 30GB 298Tk offer. The BL users who want to activate low price data package. No tension, just read this full content with attentively. In this bellow, I will share all more update information how can buy Banglalink 30GB internet only 298 Tk offer. Banglalink users will activate this data package by recharge fix amount. First, go to the message option and type “98” and send it to 2500. On the feedback message, you will see the offer eligible or not eligible for you. To activate the BL 30GB@298TK Offer, Eligible customers need to recharge exact 298 TK. Customers used maximum 1GB internet per day (1GB x 30 days = 30GB). To check the remaining balance of Banglalink 30GB@298 TK Recharge offer, just dial USSD code *124*98#. The validity of Banglalink 30GB internet Tk 298 recharge offer, 30 days. At finally we believe that all prepaid customers have got all more update information how can activate Banglalink 30GB 298Tk Internet Offer. If you faced any problem to get this special internet offer or want to know more, just comment the box. We will try our level best to solve your problem as soon as possible. Thanks to all for being here.